Most space fans hope that humans will eventually reach Mars. As for cows and chickens, that's another question. Animal rights group PETA (People for the Ethical Treatment of Animals) has sent a letter to space entrepreneur Elon Musk, founder of rocket company SpaceX, urging him to make any SpaceX missions to Mars vegan. In response, Musk told SPACE.com, "I'm a big fan of free choice for any future Martian colony. That said, it is likely that early Mars colonists would have a mostly vegetable diet, because of the energy and space needed to raise farm animals." Musk has said he hopes to fly people to Mars with SpaceX vehicles within 10 or 20 years. The company is developing a capsule called Dragon and a heavy-lift rocket dubbed the Falcon Heavy that should be capable of the job, he has said. Dragon is initially being developed to carry cargo, and then people, to the International Space Station aboard the firm's smaller Falcon 9 rocket. SpaceX has a $1.6 billion contract with NASA to fly 12 supply missions to the outpost, and is the recipient of a $75 million grant to work on outfitting Dragon for manned flights. NASA, too, is targeting the Red Planet, now that its space shuttle program is retired. President Barack Obama has challenged the space agency to build a new heavy-lift rocket and capsule capable of carrying astronauts to an asteroid by 2025 and to Mars by the mid 2030s. At this point, most engineers aren't focused on the missions' menu. However, feeding travelers to Mars will present a significant challenge. 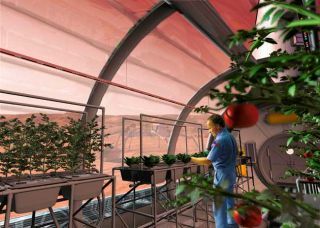 Food would either have to be launched to the Red Planet from Earth, at significant cost, or grown or created in situ, which could prove difficult. "If Elon Musk's vision of a colony on Mars comes true, the last thing those people will need is the disease and destruction that results from eating animals," PETA president Ingrid E. Newkirk said in a statement. "Whether you're settling into your new Martian home or staying here on Earth, going vegan is the best way to ensure that you'll be able to enjoy the world around you for as long as possible." While there have been several vegetarian astronauts, NASA doesn't have a policy eating animals in space. Space shuttle and International Space Station astronauts regularly eat packaged meals that include beef, shrimp cocktail, and chicken.